Language is the most important means for connecting two beings. I love languages. Each person must learn a language to communicate with the one he or she encounters. A mother teaches her child language. A salesperson must speak the language of the client. A presidential candidate must present him- or herself in a language that voters can understand. The God of the Bible and the Quran condescends to speak in the language of humans. Language connects. I love to learn languages and teach about learning languages and about cultures. This blog conveys my thoughts about the whys and hows of language-learning. The whys include motivation, whether for business or personal reasons. The hows include methods for learning languages, including my own language study. Without the whys, language-learning becomes soulless, rote learning. Without the hows, language-learning becomes expansive good will–without follow-through. I have been learning and speaking languages extensively inside and outside academia. I am fluent in four languages (Russian, Ukrainian, French, German), highly proficient in three (Spanish, Moroccan Arabic, Lebanese Arabic), and proficient at a basic level in two (Dutch, Modern Hebrew). I have reading abilities in Ancient Hebrew, Syriac, Aramaic, Ancient Greek, and Italian. I have a BA in linguistics and a PhD in linguistics and Ancient Hebrew. I have worked seven years teaching at the university level in three countries, and I have taught English to non-native speakers in classroom and informal settings. I have lived extensively (five months or more) in three countries: France, Ukraine, Morocco; and on extended stays (one month or more) in two others: Germany, Lebanon. If you are interested in individual instruction, please contact me. If you enjoy my content, please “Like” it and send it along to your friends! Here are a couple videos that encapsulate some of the ideas that are most important to me. 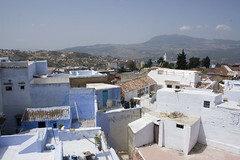 That picture is taken from the top of Hostel Souika in Chefchaouen, Morocco! I’d recognize it anywhere. Love it. Hi, I just nominated you for the Beautiful Blogger Award! Hi! Thanks so much for the nomination. I appreciate your support. What do I need to do next? You’re most welcome! Have a look at my site (http://expatsincebirth.com/2012/11/28/beautiful-blogger-award/), there you’ll find what to do next. I love learning languages, too. I have my MA in Spanish, and I am currently living in Brazil teaching English/Spanish and learning Portuguese. Someday I’d love to get my PhD. I look forward to reading more posts in this blog! Glad another language-lover found this blog! I think it’s cool you’re out there using your languages and learning others. How is learning Portuguese going? PhDs are good if you’re an idealist, but not always realistic 🙂 I’d be happy to talk more off-line about PhDs, if you’re interested. I would love to discuss it in more detail. Thanks! Thank you very much! I appreciate your thinking of me. I’m trying to put the post together. I think I may have to be a little flexible on the “200 followers” part, since I can’t always see a figure on some of the blogs I follow. I was there briefly, for a month in 2010. I was up north, at Balamand University, near Tripoli. Where in the mountains are you heading? Ah, I love the north, it’s breath-taking! I live in Ballouneh, Kesserwan, when I’m not in Beirut. Any chance at all you might be coming back? I noticed you left English out of the languages you can speak. At least, I assume you can speak English, since it’s what you’re writing in…! Anyway, I just wanted to say thanks for stopping by my blog. Yours is pretty cool! I’m totally in awe of how many languages you speak. I can only pray that once I’ve done as much as you have, I speak more than 5 languages, too! A little work every day will keep you on track for learning a language. Meet as many people as you can in your community and on line who speak your language. That will speed along your progress. Good luck! Congratulations, both your articles and your progress are incredible! I would be grateful if we could link to each other’s blog through the Blogroll widget. Hello! Thanks for stopping by. I’d be happy to connect but I don’t know this widget. Thank you for replying! It’s the one in which you already link to seven other blogs, I think it’s managed under ‘Links’ in the Dashboard. It took me a while, but I added you to my blogroll. Cheers! Thank you so much for the motivational tips you have provided in this blog.. I like Farsi a lot (من هم زبان فارسی خیلی دوست دارم)! I’ve been studying it (on my own) since about 7 months and it’s a lot of fun. maybe for me things are a little bit easier because I speak Arabic and there are a lot of similarities ( at least, some vocabs are similar).. Please keep sharing the books, websites and any other resources you found very helpful in order to master the language. Good Luck for all.. I doubt that forcing people is the right way to encourage them to discover the other(s). I like languages too but I think that each person should be free to decide whether they should/could/would learn a language to communicate with the other(s). I also think that we don’t own languages. We do own a discourse, which can be described as part of our identity, even though we often can formulate it in more than one language. But we always share the language in which we express that discourse with the other(s), i.e. someone else who does not necessarily have the same identity as ourselves (or a slightly different one at least). Languages are shared complex mean of communication but we don’t always want or need to communicate, nor should we be forced to. If you love people, set them free. Thank you for your input. You made me think more deeply about the moral imperative that I set forth here. I believe that learning languages expands one’s discourse, and expanding one’s discourse into uncomfortable areas makes one more intelligent and more human. I guess it’s not nice to impose on anyone to enter that discomfort or become more human, but I hope one takes into consideration the imperative I set out. There are other ways to move into that discomfort and expand one’s humanity. Music, art, literature, religion–all of them bring one into that space. No one has to be free, but most people long to be free. I hope that people will find in languages the ability to break out of their mind’s confinement to see and experience their humanity in a new way. Would you be interested in writing a guest post for a series of posts called Perspective Collective for Language Boat? I am asking several language bloggers I admire the same six questions. My goal is to get a variety of perspectives and methods on language learning. I have a very specific learning style and approach. I’d like to offer Language Boat readers a wider range of learning expertise and introduce them to blogs and resources they may not yet know about. Of course if you agree to guest post I will link back to your blog and introduce you as a guest blogger with a mini bio and photo. The following are the six questions I am asking. Thanks for considering it! Let me know if you have any questions! That sounds like fun! Thank you for thinking of me. I’d be happy to do a guest post. Hi! I emailed you my responses. Thanks for thinking of me! Rich, have you ever thought of doing a blog (or podcast) about Bible study? I know some valuable aids for learning and improving Ukrainian even for advanced high levels (in addition to Ukrainian-English phrasebooks). Some valuable general thematic English dictionaries and conversation books/materials could be translated into Ukrainian for bilingual use. I could provide you with a list of such materials. How do you use your Ukrainian and Russian language skills? I use my Russian a little at work and with friends. Ukrainian I use only rarely these days, but it comes out ok still. What is your Ukrainian background? I visit my relatives in Ukraine from time to time and travel in Ukraine. I know Ukrainian. Ukrainian vocabulary for English Speakers – English-Ukrainian – 9000 Words [Kindle Edition], Andrey Taranov (Author). A very valuable aid for learning Ukrainian vocabulary by topics logically, intensively and comprehensively. The vocabulary has 256 topics. Helps you learn and memorize Ukrainian words. Perfect for self-study and reviewing. Conversational Ukrainian (by Yar Slavutych, fifth edition, 1987, 608 pages, the most complete Ukrainian conversation book). You can practise your Ukrainian language skills in the Ukrainian community in your area and maybe travel across Ukraine, etc. that may be of your interest. Richard you can also practise listening comprehension, speaking, reading and writing in Ukrainian. Listening comprehension: you may use audio and video aids, and websites for learning Ukrainian including on youtube.com choosing topics of your interest and potential needs as a priority. I like to listen to Ukrainian songs (especially pleasant wedding and folk songs and music), concerts, travel videos, videos on recipes of Ukrainian cuisine, on Ukrainian traditions, customs, culture, crafts and other Ukrainian things that appeal to me. Those sound like great suggestions. I’ll have to check them out–I don’t want to lose my Ukrainian! I love that you love languages so much! Me, too! By the way, I run a series on my blog called “The Many Faces of Bilingual.” Let me know if you’d like to participate/share your story with my readers. Audrey. I’d be happy to. Let me know the details of what you might be interested in. Great! Could you email me at audrey.kratovil@gmail.com ? What a beautiful concept. Throughout my travels, I’ve never felt more connected with different cultures than during the emergence of that spark of understanding, when a local understands and appreciates that first word or two you test out, or the commonality of certain vocabulary that can transcend national borders. Good stuff! Thank you for your kind words and your insight! This is Kimberly writing from HelloTalk, a Language Exchange Learning App. I’m writing this comment wondering if you could take a time to look at HelloTalk and review it. HelloTalk is an app which is similar to WhatsApp but has more features on language learning. Such as in-app translation, text-to-voice, voice-to-text, transliteration, and grammar correction. So far, there are more than 100 languages in the app and over 1,200,000 users worldwide. By using HelloTalk, one could learn and practice a language with native speakers. To know more about HelloTalk, please visit: http://www.hellotalk.com/, http://www.fluentin3months.com/hellotalk-review/. Just found your blog through your comments on “What if we talked about monolingual white children…” I love what you are doing here at lovinglanguage. Glad to connect. Thanks, Dawn. I love your blog, too, and I look forward to digging into it deeper. I would like to get in contact with you. I have been teaching ESL here in Minneapolis for 30 years, and I am trying to find a Somali teacher. I’ve been on this quest for almost a year, and I’d appreciate any suggestions. My husband taught Ancient Near Eastern Studies here at the U of M for twenty-six years. He taught Ancient Hebrew, as well as Aramaic. He would be delighted to speak with you. Is there any way we can do this? Thanks! Thanks for getting in touch! I would love to talk more. I just found your blog because you “liked” a comment I made about voluntourism on Master of Something Yet. I am a language lover, bilingual English-French with some –mostly academic—exposure to Latin, Spanish, German, Italian. I agree with everything you say here, and am glad I found you. I will be back! I’m so happy you found the blog. Thanks for coming by! I like this blog as I love english language. Thank you! I hope your study of English is going well. Thanks, but I speak english, no need to study the language much more. Best wishes. Michael, The commercial potential of your unique skills is grossly undervalued. Thanks for writing. This is a tough one. First, since all the kids are at very different cognitive stages, they will learn differently. Your youngest may never remember living in Spain, for example, while the oldest surely will remember plenty. I don’t know the research, but I can tell the stories I know. I remember my friend’s grandmother who came to the US in her 20s from Hungary. She told us that she couldn’t speak any Hungarian any more. I have a co-worker who grew up in Bolivia speaking Spanish with a lot of indigenous languages, too. When she first moved to the US as a teenager, she lived with her aunt and spoke all of those languages. Yet she speaks Spanish with a strong accent, and says she no longer speaks the indigenous languages. At the same time, I had a friend in college who spent her whole life in San Diego with parents from Mexico. Her Spanish was beautiful. My friend’s four kids, aged 7-12, lived their whole lives in the US. Their mother is Russian, and their grandmother comes to visit on a semi-regular basis. Their Russian abilities vary from person to person. As a result, I don’t know what kind of guarantee of fluency to expect of children. I think that unless you have a Spanish community for them to be a part of, it will be easy for them to lose the language. Even that is tough. I just talked to a Somali teenager at the store. He said he doesn’t speak much Somali, even with his brothers, yet his parents speak Somali with each other. I hope this is the beginning of an answer for you. Good luck! I would like to personally congratulate you as your blog Loving Language has been selected by our panelist as one of the Top 100 Language Learning Blogs on the web. I personally give you a high-five and want to thank you for your contribution to this world. This is the most comprehensive list of Top 100 Language Learning Blogs on the internet and I’m honored to have you as part of this! My name is Maritza and I own an agency in Southwest, Minnesota. I have a request for a Kudama interpreter that could help out with a mom, who doesn’t understand what is happening with his juvenile child. The case is serious and it is necessary to have someone that could help out with the case. Would you be able to help out? My phone number is 605-201-6343. Thanks for thinking of me! Could be Oromo too. Did you ask? Unfortunately I didn’t get to try again – I wasn’t able to get rebooked on a flight so I just rented a car and drove back to Chicago. Next time, though! Is there a way to contact you? I have recently moved to SW Minnesota and want to learn Somali. have a few other languages under my belt but am coming up with nothing locally for resources.Any assistance would be greatly appreciated.